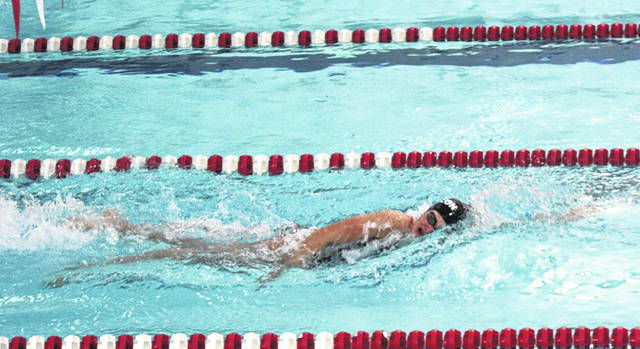 Ryan Scherer of Wauseon swims in the 500-yard freestyle at an earlier home meet this season. At the sectional tournament last week, he advanced with first place finishes in the 200 IM and 100-yard butterfly. Brooke Schuette of Wauseon in a regular season meet versus Bryan earlier this season. She took first in the 500-yard freestyle and second in the 200-yard freestyle. NAPOLEON – The Division II sectional swimming and diving meet was held last week in Napoleon with Wauseon qualifying several to the district meet. In the diving competition last Wednesday, four Wauseon divers advanced. Kennedy Nation took eighth in the girls competition, Bailey McGuire was 14th and Madison Baugh 18th. Cade Smith placed 11th in the boys competition. 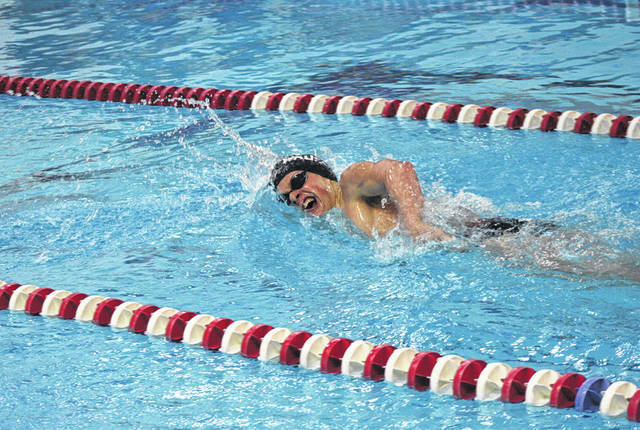 On Saturday in swimming, the Wauseon boys were led by Ryan Scherer and Branden Arredondo who each won multiple events. Ryan Scherer was first in the 200 IM and 100-yard butterfly, while Arredondo took first in the 50-yard freestyle and 100-yard freestyle. Other individual qualifiers were Andrew Scherer in the 500-yard freestyle and 100-yard backstroke, plus Maddux Chamberlin in the 200 IM and 100-yard butterfly. The Indians had qualifying relay teams in the 200-yard medley relay, the 200-yard freestyle relay and 400-yard freestyle relay. On the girls side, McKenzie Darnell won the 200-yard freestyle and Brooke Schuette placed second. Schuette was first in the 500-yard freestyle, while Darnell placed second. Sarayna Russell placed fourth in the 100-yard freestyle to advance. She also qualified in the 50-yard freestyle. Other qualifiers were Megan Carroll (200 IM, 100-yard backstroke), Maggie Roelfsema (100-yard butterfly, 100-yard breaststroke), and Ramah Witt (200-yard freestyle, 500-yard freestyle). The Wauseon girls had qualifying relay teams in the 200-yard medley relay, 200-yard freestyle relay and the 400-yard freestyle relay. The district meet at Bowling Green State University began Wednesday with the diving portion of the competition. It concludes on Friday with the swimming portion. 200 medley relay- 3. Wauseon (Andrew Scherer, Caden Case, Maddux Chamberlin, James Hutchinson), 1:51.89. 200 IM- 1. Ryan Scherer (W), 2:03.37. 50 freestyle- 1. Branden Arredondo), 22.94. 100 butterfly- 1. Ryan Scherer (W), 54.78. 100 freestyle- 1. Branden Arredondo (W), 49.82. 500 freestyle- 4. Andrew Scherer (W), 5:19.19. 200 freestyle relay- 2. Wauseon (James Hutchinson, Caden Case, Ryan Scherer, Branden Arredondo), 1:33.06. 400 freestyle relay- 1. Wauseon (Maddux Chamberlin, Andrew Scherer, Branden Arredondo, Ryan Scherer), 3:27.05. 200 freestyle- 1. McKenzie Darnell (W), 2:00.17; 2. Brooke Schuette (W), 2:02.26. 100 freestyle- 4. Sarayna Russell (W), 56.84. 500 freestyle- 1. Brooke Schuette (W), 5:12.79; 2. McKenzie Darnell (W), 5:20.69. 200 freestyle relay- 4. Wauseon (Russell, Carroll, Schuette, Darnell), 1:43.77. 400 freestyle relay- 3. Wauseon (Russell, Witt, Schuette, Darnell), 3:44.72.